Energy savings and renewable energy are the only viable solutions for decarbonising Europe’s energy system. Reducing energy consumption is the most immediate way to reduce greenhouse gas emissions. At the same time energy savings reduce import dependency and enhance energy security. Energy efficiency measures can also boost industrial competitiveness, create millions of jobs, reduce energy bills, help relieve energy poverty and improve air quality. An overall EU energy efficiency target for 2020 and a series of EU energy efficiency policies and measures are already in place. They cover different sectors such as buildings, appliances, vehicles and the energy supply sector. In 2016, the European Commission presented its “Clean Energy Package for all Europeans.” It includes a legislative proposal to review the Energy Efficiency Directive (EED), including its energy efficiency target for 2030, and adjusts key efficiency measures to the 2030 timeline. Overall, the European Commission’s proposal falls far short of what is needed to strengthen the EED to deliver deeper emissions cuts, and help turn the EU’s Paris Agreement commitments into reality. 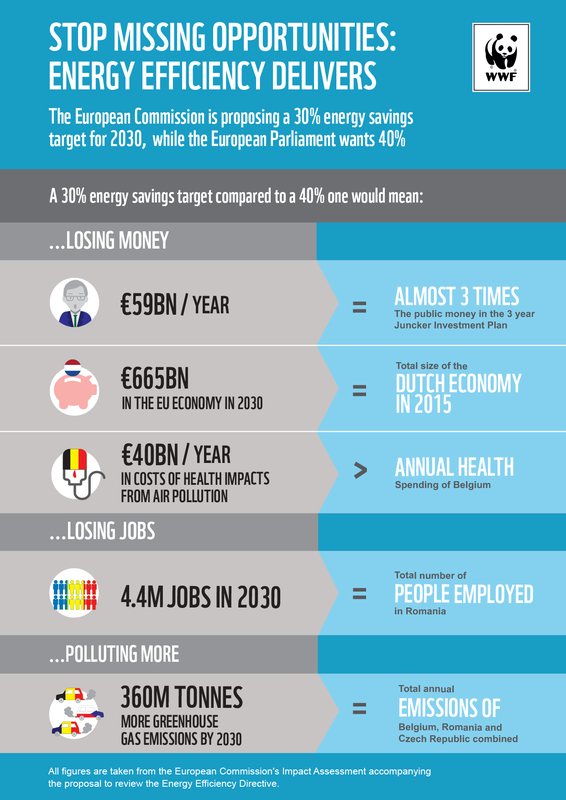 The European Commission’s review proposes a binding 30% energy efficiency target for 2030. Although this is a step in the right direction we need a target of at least 40% to match the Paris Agreement and to take full advantage of the benefits of energy savings. The Commission also proposed to extend the requirement for Member States to save 1.5% energy each year beyond 2020. However it included loopholes which mean Member States can get away with only 0.75% energy savings a year. The Parliament and the Council are currently reviewing the Commission’s proposal through the ordinary legislative procedure. The Council has already adopted its position: their proposals would significantly weaken the annual energy savings obligation and profoundly undermine the EU's commitments under the Paris Agreement. The Council also agreed to a 30% energy efficiency target for 2030 but refrained from specifying whether it should be indicative or binding. The Environment Committee has recently adopted their formal opinion on the file and called for higher ambition for the future energy efficiency law. The Committee voted for an EU binding 40% energy efficiency target for 2030, national binding targets and a stronger energy savings obligation. After an initial damaging report from the Industry, Research and Energy Committee’s rapporteur the Parliament is still debating its position. Once the position of the European Parliament is finalised, the Directive will enter trilogue between the Commission, the Council and the Parliament. We work to ensure a robust energy efficiency policy framework underpinned by ambitious binding targets and policies that will help mobilise the investments needed for the transition to a fully renewable and efficient energy system.